my last post on feng shui focused on loving & maximizing your bedroom as your sanctuary. ideally, your bedroom should be your place for sleeping & loving, not working. but for some of us (me included) the bedroom also has to function as a workspace. I use my bedroom for writing & practicing music, making jewelry, and doing all things tsii. in this post, I will approach these functions separately, and hone in on feng shui applications for your creative workspace, whether it's located in your bedroom, your living room, an office downtown, or a barn conversion studio in the country. from these principles, you can begin to understand the importance of care & awareness for every energetic aspect of your life. feng shui focuses on your space & environment. the bagua still applies to your workspace in the same way it applies to your bedroom. 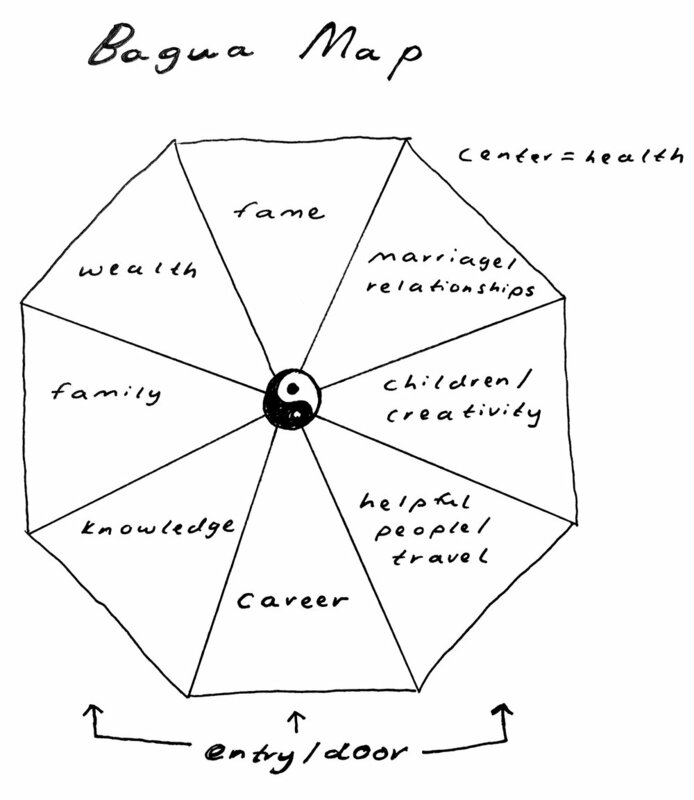 note the way that you enter your workspace, and then map the bagua onto your space with the knowledge, career, & helpful people wall falling on the same wall as the door. your door will enter the room in one of these three guas, and each corner will be either wealth, marriage, knowledge, or helpful people & travel. then you can know where you might want to position the furniture in your workspace. does the task resonate with the gua? think about putting your desk, for example, in your career, knowledge, or fame gua, depending on your artistic & business goals. if you are painting, practicing music, or writing poetry, you might want to put the tools for these tasks in your creativity gua. play around with this & see how different things feel in different guas. I store my jewelry supplies in my vintage box & tin collection. also shown: la times featuring my block cloth shirts, waiting for frames. try displaying any press on your work in your fame gua. 1. tools, gear, supplies & anything you are using for your creative projects is not clutter. clutter is anything that you are holding onto that you do not actually need or use, or that no longer inspires you. 2. however, the way that you store & organize these things is dearly important. make sure everything is organized, meaning that you know where to find each item, even if no one else could. make sure that everything you use on a daily basis is readily accessible to you. I also love using tools & supplies as decoration. keeping your gear out where you can see it will inspire you & add ease to your daily work flow. you might keep your guitar collection on guitar hooks across your wall, or you might keep your paints on a shelf with all of the colors visible. I also like to store small items, like my jump rings & earring lever-backs in cute vintage boxes & tins on the shelf right next to my desk. 3. do regularly make time to clear out anything that qualifies as clutter. I recommend making this an integral part of your creative flow: as soon as you are done with a project, clean up by organizing, recycling, or donating any remaining bits & pieces from the project. be realistic about what you will use again & what has no real right to take up precious space in your creative studio. for those whose primary mediums are digital, clear out & organize projects & files on your computer, too. make sure that you can see the door from wherever you sit or stand in your studio or office. this will calm & empower you. this arrangement instinctively helps us feel in control of our space, and also helps us feel in control of our lives. when you face your door, you are able to face your life & any challenges or blessings that come your way. this is especially important for your workspace, where you want to feel supported in proactivity, deadlines, & clear communication with collaborators. mirrors & original artwork add positive chi to your space. this painting is by minnesota artist kerry pennings. as with your bedroom, you can use the basic feng shui cures, mirrors & plants, to help the flow of chi in your workspace. use mirrors to open up spaces that feel cramped, to expand parts of the gua that the structure of your room cuts off, or to draw in views of natural beauty outside. plants are a great source of life force & positive chi. add them to any area of your space that needs a little boost of chi, and make sure to care for them lovingly. lighting is important, too. make sure your lighting is adequate for your projects, but also fits with the mood you want to cultivate in the space. I like a lot of light, but I like it to be warm & soft, and I tend to like a mix of vintage & modern lamps & lamp shades. you can also draw in positive chi with original artwork, as well as through photos of loved ones, mementos from travels, or other objects that bring you joy & inspiration. I am a sentimental person, so you'll see these all over my space. I like to have all of my recent jewelry designs hanging above my desk for focus & inspiration. for your walls & decorations in your studio or office, consider using a color that energizes & inspires you. this might be a warm color, like curry orange, brick red, or warm violet. choose a hue that you love & want to be surrounded by while you're working. because you use your workspace as an incubator for all of your creative inspirations, you want the hues in the room to spark that fire. to get you started, here is a quick guide to colors & their vibrations in feng shui, the chakras, & color psychology. because your workspace is your hub of creativity, don't be afraid to change things around often. there is no one-size-fits-all feng shui lay-out, and even in your space there will be different positive benefits to different layouts. rearranging your space every few months or so can reinvigorate you creatively as you respond to the new flow of chi. just make sure that each time you rearrange you are paying attention to your guas & the tips above, as well as to your own intuitive response to the new adjustments. have fun creating & exploring feng shui in your studio!! feng shui follow-up: I have a few updates on how I've rearranged my room since my last post. the most important thing that I did was move my bed out of the corner, so that I can get in & out of both sides of the bed. in order to have balance in relationships (with yourself or with a partner), your bed should have equal access from both sides. this empowers both you & your partner and helps foster mutual agency & communication. to make this change, I shifted around my shelves & also ended up un-stacking a dark wood stackable shelf that seemed to tower over everything else in the room. this shelf had even begun to lean to one side from the weight of all the books & knick knacks on it! by moving my bed, I also brought my bed out of line with my bathroom door. you never want to sleep in the energetic line of anything that flushes chi away, so this was a great way to double-up on benefits. my desk is still in my career gua, my bed is still in my marriage gua & now touches my children & creativity gua, and I now leave my guitar on a guitar stand in my fame gua.